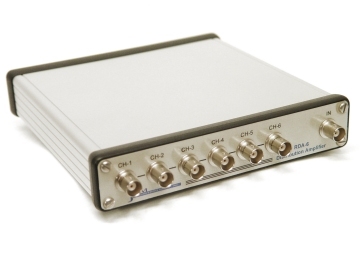 The RDA-6A is a six (6) channel Reference Distribution Amplifier designed for distributing an external reference frequency standard, such as a Stanford Research PRS-10 Rubidium reference or a Trimble Thunderbolt GPS disciplined oscillator, to laboratory equipment such as frequency counters, spectrum analyzers or signal generators. 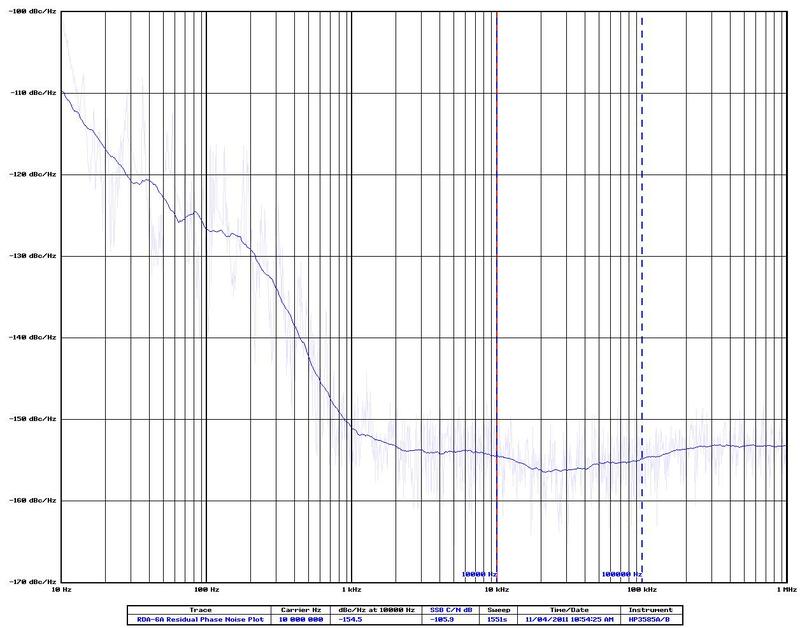 This allows all of your laboratory equipment to be stabilized to one reference frequency. The RDA-8A is identical to the RDA-6A with the addition of two (2) 5 MHz reference output ports on the rear of the unit. The RDA-6A provides high isolation between output channels and high isolation between any output channel and the input channel This prevents one piece of test equipment from disturbing another which is a typical problem using resistive power splitters to distribute a reference frequency. The output level is typically +10dBm with a +10dBm input channel level. This meets the required driving level of most test equipment. Each channels output level can be adjusted over a 58dB range from +13 to -45dBm, allowing independent level settings for each channel if needed. The 5 MHz reference outputs on the RDA-8A are not adjustable and are set for an output level of approximatly +10dBm at the factory. Each Reference Amplifier is powered from a wall mounted 12VDC power supply and the unit is always powered ON as there is no power switch to get turned off accidently. A front panel green LED indicates the power on condition of the unit. When you place your initial order by Credit Card, you will receive an EMail verifying your order placed through our Secure Website at Verisign. When the order department at JWM Engineering receives your order, they will compute the required shipping and handling charges for your country, and EMail back to you the necessary charges to complete your order, and a Weblink you need to go to finish up the shipping charges. JWM Engineering Group only charges for shipping and handling. You are responsible for Duties, Taxes, Tariffs, and/or Consumption for your country of origin. We typically ship overseas orders by US Postal Service. Please use the shipping option "Outside USA" in the shipping cart as your shipping choice. This is only for customers outside the Continental US.